In 2006 after a back operation, Doc, bass player with Katsquire, Doctor Bison and a thousand scratch bands, picked up a 16 Track digital porta studio, sat in his living room and thought, “ wonder how this works? “ . A few days later he’d started writing a couple of songs and a couple of weeks after that had recorded a whole albums worth of tracks. First idea was to sell them as a library album for adverts, TV and elevators, but good friend and former band cohort Rob ‘Livestock’ Davies persuaded him to get it pressed up and released. The result was DIED JOGGING. After moving to Deepest, darkest West Wales he finally met up with Richie Evans, Double bass player and lifelong Rockabilly fan. He’d played with bands including Tootinskamoon, a successful Ska outfit, but his true passion was Rockabilly. Doc shifted from bass to guitar and vocals they started a search for a drummer and that illusive second guitarist. “I would have given up trying after the first half dozen, I’ve never been one for rehearsing and that’s as far as we were getting, but Richie kept me going with his ardent enthusiasm, as did a few friends and supporters. You know who you are”. Drummer John ‘haircut’ Lovell was playing in Richie’s other band, Monsterometer at the time and fancied a crack at the job. They decided to rework a lot of the old songs, stay as a three piece and Doc & the Headshrinkers, the band, was born. A handful of rehearsals under their belts and at last, Died Jogging, Heart Attack and others from that first album got a well-received live airing at the Rampin in Cilgerran. The lads immediately set to work on penning some new songs and went into Fflach studios in Cardigan, with the aid of Wyn and Richard Jones, to record a single, “If there wasn’t any sinners the saints wouldn’t look so good” choosing to release on 7” vinyl. A trip to local venue The Parrot in Carmarthen with friends and supporters produced the video, released on Youtube, that goes side by side with it. Official launch party is set for 21st July 2017. The Headshrinkers are currently recording their first album as a band, entitled “Crash Land”. “I’d already written and recorded this album before I moved ‘West’ but held off its release until I found the opportunity to play it live. We rehearsed and gigged a few of the tracks but once the band established its own identity I decided to write a handful of new ones sculpted to suit the three piece format and adapt, where possible, the original tunes. We’ve got a much rawer sound with an edge to the live performance that I want to expose with this album”. Plans have been firmly laid by the Headshrinkers for the road. A tour of Europe and gigs to promote the Album at the forefront. One of the most exiting Rock n Roll outfits in the world today. 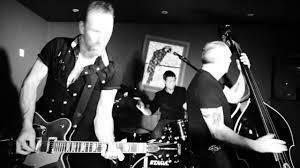 They fire their own updated brand of Red Hot, Raw Rockabilly into the 21st Century all guns blazing. Prepare for CRASH LAND!